It may start with a single sighting in your kitchen sink but then you see two more… a third, a fourth and more and more. Ants are social insects, they form colonies that are huge on communication and cooperation. They are almost, if not actually obsessive compulsive insects. They have designated members for specific tasks, to ensure order and mass reproduction rates. In the mist of having an unwanted ant problem, read below and at least learn a few interesting facts due to your unfortunate encounter with these insects. We know all of these details to help us effectively eliminate their presence in your home or office. There can either be one queen per colony or several. 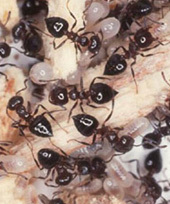 Queen ants are the sole reproducers of the colony. They live the longest, anywhere from 5 to 30 years – which actually makes a queen ant the longest lived insect. They might just live in your home longer than you, if you do nothing about them. Male ants live the shortest of all the ants and they serve only one purpose: to mate. Then they die. They do not protect or gather food and they only live months, at the most. A male ant is developed from an unfertilized egg. All the females that are developed, other than the queen(s) are workers, gatherers and protectors. These ants are the ones you see in your sink, on the pavement or anywhere else. They tend to the queen, eggs and see that the colony is fed and protected. Worker ants live anywhere from 1 to 5 years. Each and every ant in a colony is important for its growth and if it’s a colony that you would like to rid your home or office of, it is important to eliminate all members of the colony, not just the worker ants, the queen or the male ants. A well thriving colony can easily overwhelm a room in your home, as it provides shelter, warmth and convenient food. If you need to control the ant population in your home contact Eco Tech today for effective and environmentally friendly extermination services at (763) 785-1414!